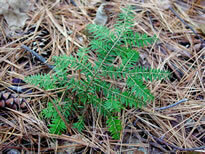 Here's a hemlock seedling I found in the woods. It's about 15 inches tall. Hemlock trees can grow with very little sunlight, but they grow very, very slowly in these conditions. much as 100 years old! However, if these saplings begin to get more light (for example, if some nearby trees fall) they will start growing much faster. Earlier this week, my neighbors saw a bald eagle a few miles down the road. They said it was flying pretty low to the ground and was being harassed by 3 or 4 crows. This "mobbing" behavior is practiced by many types of birds - including songbirds - when a predator is in the area. There is some debate as to the purpose of this behavior, but most think that the intended result is simply to chase the predator out of the area - and to alert other birds to its presence. Since this behavior seems more prevalent during the breeding season, some think that the intent - at that time - might be to distract the predator's attention from the nest. Saw a couple of red-breasted nuthatches (one of my favorite birds) and a tufted titmouse at my birdfeeder this morning, along with the usual chickadees. have a hard time telling those two similar songs apart. I have to wait until I hear it sing a different song to know which bird it is. The chipmunks have been quiet for the past 4 or 5 days, so maybe they've retreated to their dens for the winter. It was a particularly warm day yesterday, so I thought they might be "chipping" again - but not a sound. Now that I've put the birdfeeder out, the chipping of the chipmunks has been replaced by the songs and calls of the chickadees. And they've been eating a lot! I wonder if they're preparing for the storm that we're expecting tomorrow night. The fog in the valley was pretty this morning. If you look closely you can also see a tiny bit of remaining fall foliage. On days like this, the fog is in constant motion, providing a show well worth watching. At other times, the fog completely surrounds the house and gives a beautiful, ethereal look to the woods around me. Here's a very useful site that has photos and information about more than 50 species of North American Trees. Each factsheet contains a brief description of the tree's physical characteristics and preferred habitat. It includes a photo of the entire tree plus photos of the leaf and fruit. Note that the range information is for Canada. Saw a gray squirrel today. Surprisingly, I don't see very many of them in the area near my house - or in the woods nearby. Lots and lots of red squirrels, though. Red squirrels are more aggressive and territorial than gray squirrels. I've heard that red squirrels will chase gray squirrels that come into their territory. That may explain why I see so few of the gray ones!